GHK Motors biggest everLucky Draw Event is here again!!! In 2013, we have one of the biggest draw in town which was BUY ONE WIN ONE Promotion where we giveaway 1 unit Mitsubishi Triton and 1 unit Daihatsu Sirion. Oursales were overwhelming where we achieved more than 1200 units in 6 months. This year we want to do bigger and better than last year promotion. 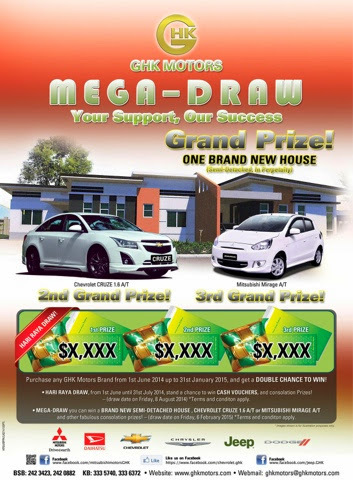 Our Mega Promotion will be not only one draw, but two draws which is Hari Raya Draw and Mega Draw. Moreover, the promotion apply to all the GHK Group Franchises such as Mitsubishi Motors, Daihatsu, Chevrolet, Chrysler, Dodge and Jeep. The grand draw prize is 1 unit semi detach house, 1 unit Chevrolet Cruze, 1 unit Mitsubishi Mirage and many other attractive prizes. Customers who participate as well as winners from the “Hari Raya Draw” are also eligible for the “Mega Draw”. The “Mega Draw” will be drawn on 6thFebruary 2015. Customers can drop by to GHK showroom during working hours or follow us on our facebook page (https://www.facebook.com/mitsubushimotorsGHK ,https://www.facebook.com/chevrolet.ghk ,https://www.facebook.com/Jeep.GHK ) for any upcoming promotions, events and activities.